In 1978 a group of archaeologists made a discovery in Afghanistan’s north that was to become one of the most exciting finds of the 20th century. 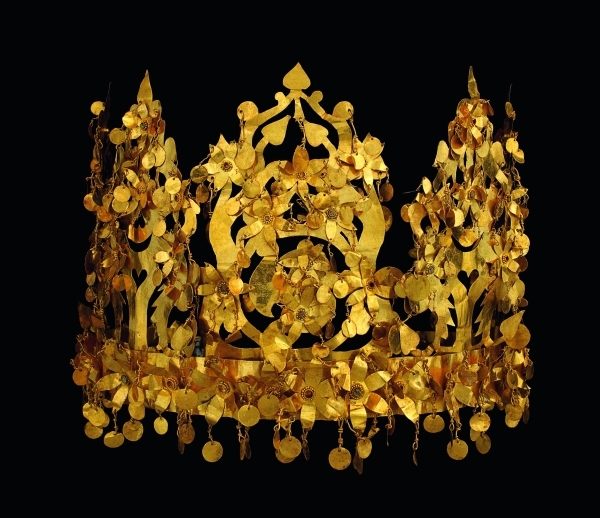 Collapsible crown made of gold found in the tomb of a nomad woman. It was made to be collapsible for ease of transport – a must for nomadic life. 2nd quarter of 1st century AD. Source: Thierry Ollivier / National Geographic. Pendant showing the “dragon master”. Found in the tomb of a nomad woman in her 30s or 40s. Gold, turqoise, garnet, carnelian and pearl. 2nd quarter of 1st century AD. Souce: Thierry Ollivier / National Geographic. Digging in an area known as Tillya Tepe, which means “the Hill of Gold”, they unearthed the graves of several high-status nomads who had lived around 2,000 ago. They had been buried with an astounding number of precious objects; in fact, more than 20,000 artefacts were discovered, most of which were crafted from gold and semi-precious stones. 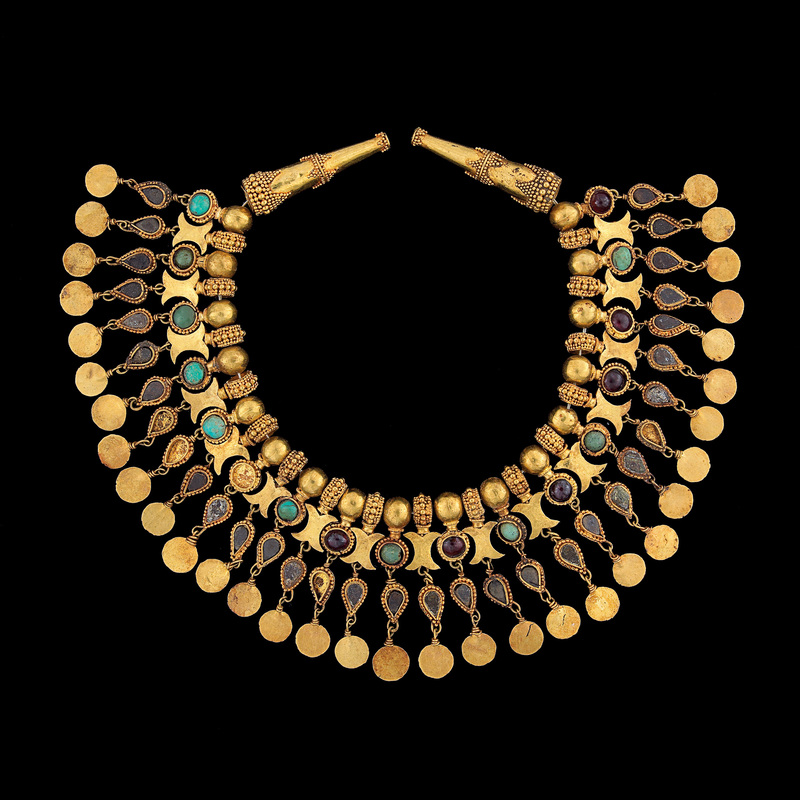 Often referred to as the “Bactrian hoard”, it was compared to the discovery of the treasures of Tutankhamun’s tomb in Egypt. 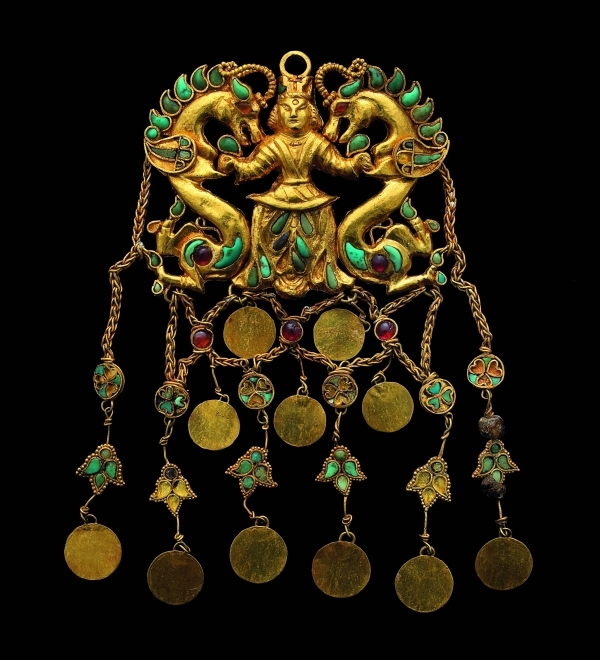 The archaeologists discovered jewellery, weapons and ornaments revealing the influence of the many cultures that passed along the Silk Road. 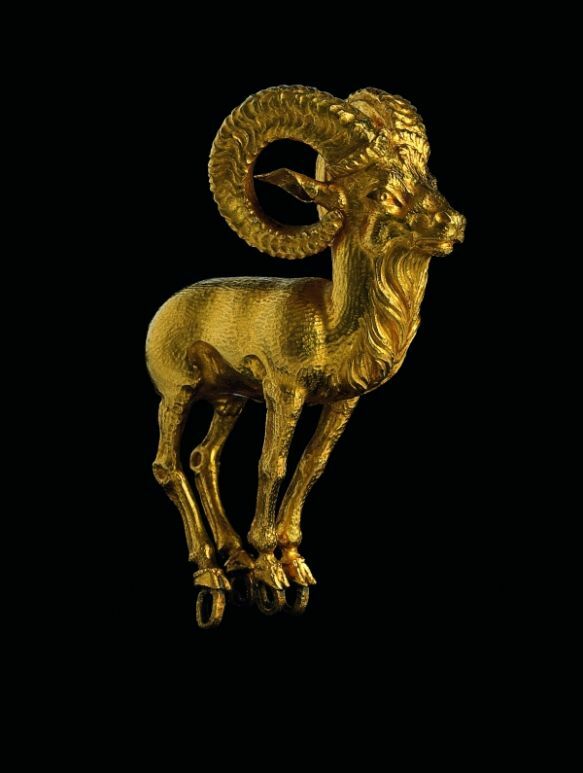 Head ornament in the form of a ram. Found in the tomb of a male nomad. 2nd quarter of 1st century AD. Source: Thierry Ollivier / National Geographic. Ornament for the neck of a robe, Tillya tepe, gold, turquoise, garnet, and pyrite. 2nd quarter of 1st century AD. Source: Thierry Ollivier / National Geographic. One of the tombs was that of a male nomad, who was buried with weapons, jewellery and ornaments indicating high status as a leader and warrior. The other graves discovered belonged to women. Their costumes varied, which may have indicated that they were from different tribes, but it’s thought more likely that this may have reflected their social status. In all, 6 tombs were excavated, but no further research or excavation was able to be completed in the area. A seventh grave was discovered just before winter fell; it was carefully covered over to be investigated the following year, but in 1979 war broke out in Afghanistan and sadly the archaeologists couldn’t return. Afghanistan: Hidden Treasures from the National Museum, Kabul is on at Queensland Museum until 27 January 2014.